Standley Feed and Seed offers a great selection of horse treats by Manna Pro. 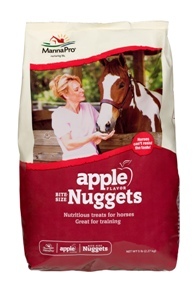 These Bite-Sized Nugget horse treats are perfect way to show your horse companion you care. We carry flavors lie Apple, Peppermint, Carrot & Spice Nuggets. Come by today to claim your alb bag of bite-sized nuggets. Your horse will thank you! Stop by one of our locations for all your equine feed and supplies. We carry high quality brands that offer nutrition for your specific horse needs. This entry was posted on Sunday, June 5th, 2016 at 3:52 pm	and is filed under News & Updates. You can follow any responses to this entry through the RSS 2.0 feed. Both comments and pings are currently closed.